Not the best Indiana Jones film, but probably tolerable if you like the franchise. 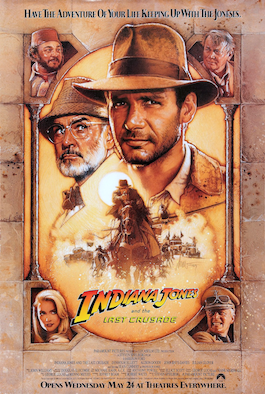 After tracking down the Ark of the Covenant in Egypt (of all places – I assumed it was kept under lock and key in Axum), Indy goes after the Holy Grail. Yes, kids, it´s "Indiana Jones and the Last Crusade". Somehow, the right Arthurian-Parsifalian-Christian feeling never materializes, but hey, it's an Indiana Jones flick. If they ever make a sequel to this one (and decide not to include ancient aliens), may I propose a chase after the Spear of Destiny to Rosslyn Chapel?